As a fitting conclusion to our history, we now shift our focus to the last days before a trooper left Bravo Company to return to the States. In previous conflicts, like the Korean War and World War II, the service obligation for draftees and volunteers was for the “duration of hostilities”. This was not the case for the Vietnam War and for the first time in the history of the US military, a tour of duty in Vietnam was officially fixed in length to exactly one year for US Army soldiers and 13 months for US Marines. Consequently, it was standard procedure to notify each trooper when he arrived in Vietnam of the exact date when he would return to the US and this date was commonly known by the military abbreviation DEROS - Date Expected Return from Overseas. For those serving in Vietnam, a short-timer was a soldier nearing the end of his combat tour of duty. Many troopers maintained a short-timer calendar and some of these were very imaginative. Here is Mike Spehar’s calendar that he started 120 days prior to his departure and with arrows pointing to two things that he was looking forward to - “Mom’s Mess Hall” and “Camp Home”. The main point of this particular calendar was to signify that in the last couple of weeks you were so “short” that you were invisible. 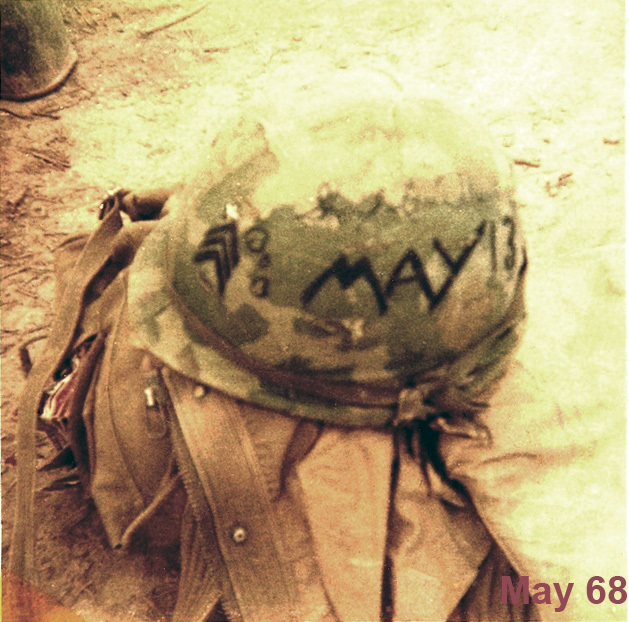 When one became a short-timer, some identified their DEROS date by marking it on the camouflage cover of their helmets. 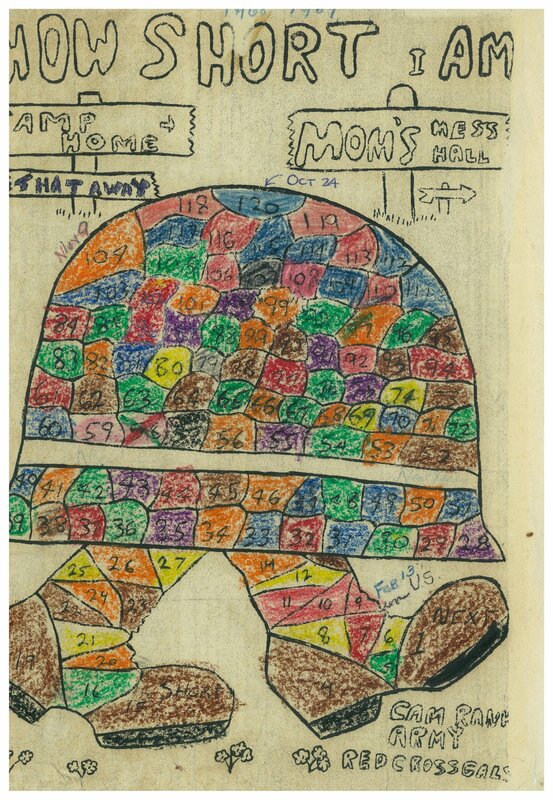 Some troopers started the countdown to their DEROS date when they had 100 days remaining in Vietnam and this was often launched with a boastful announcement of “99 days and a wake-up”. However, everyone knew that 99 days and a wake-up was still a long time and that the real countdown started around 30 days prior to DEROS. This was the time for bantering reminders from short timers that they would soon be heading home in the “freedom bird”, the nickname for the chartered aircraft that took us back to the States. For soldiers serving in Vietnam, the States was affectionately known as “The World” and the “Land of the Big PX” (PX is a military department store). While these bantering remarks from short-timers were mostly expressions of happiness, they also contained a hidden element of sadness because of the approaching end to some very unique and special friendships that are forged between members of combat units. As mentioned in an earlier section, trust formed the cornerstone for these special relationships and here we are referring to the ultimate form of trust - that of entrusting others with your life. In combat one has to trust that each member of the team will act to protect the others from harm, and this meant that the members of a team acted as guardian angels for each other and their golden rule was “not to let their buddies down”. This unmatched level of trust between team members was always present and not just during a firefight, but also when patrolling, on guard duty, on ambush operations and while conducting combat assaults. While trust was the cornerstone for these special relationships, it also fostered the development of close friendships between team members and the willingness to take act bravely and take dangerous risks to protect your buddies. Because of the intense nature of these special relationships, it was not easy to end them and there are good reasons for believing that they were permanent rather than temporary. As revealed in the following thought-provoking statement made by a former Bravo Company trooper in May 2009, these special bonds established many years ago are bonds that last a lifetime: Life takes us on many paths but there are a few "touchstone" events that shape our lives. I can cry for my father and mother that have passed...they loved me dearly...but it is to those that I served with and to those that have fallen...that I reserve a special corner of my heart. Although we physically left Vietnam at the end of our tour of duty, the awesome experiences of combat had a profound and life long effect on all of us who served in Bravo Company from July 1967 to July 1968.